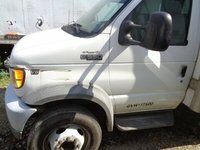 / Does my 2005 Ford Econoline E-350 Super Duty Extended Cargo Van have a timing belt or chain? Does my 2005 Ford Econoline E-350 Super Duty Extended Cargo Van have a timing belt or chain? Timing chains is what it has. And what a nightmare. I have a 2004 F-350 econoline box van with bucket seats. I need 3 seats. Can the 40/20/40 front seat from a 2004 Ford E-350 Super Duty be installed in a 2004 E-350 Econoline box van? My FORD E250 SUPER CARGO van makes a strange, whine when accelerating. It is ongoing as I drive, dies down when my foot is NOT on the pedal, but gets louder as I push on the gas. Start a new Ford E-Series Cargo question. Looking for a Used E-Series Cargo in your area? CarGurus has 141 nationwide E-Series Cargo listings starting at $6,999.